Features: Extremely RARE... Impossible to find! ABSOLUTELY RARE almost impossible to obtain and collect in this magnificiant condition! ONLY MADE for less than 1 year, vintage from 1930's, 17 jewel mechanical movement, subsidiary seconds too! Listed in most watch collector books for a conservative couple of thousand in this condition. Have also one of the older Blue vintage Gruen boxes that is included. Dimensions are 39 mm x 22 mm. 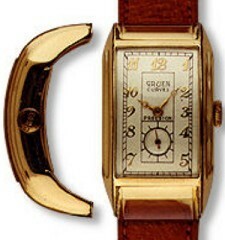 The curved lugs have a 20 mm 90 degree arch too...the entire arch length of the case plus the curved lug ends is approximately 60 mm as this incredible wristwatch forms a 180 degree half circle on the wrist. This is is ultimate driver's wristwatch produced by the company that invented the Extreme Curve Driver's watch! From the history of Gruen. 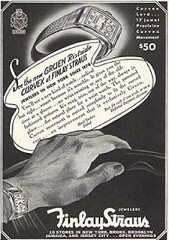 Among the rarest and most collectable of Gruen wristwatches are the "driver's" models, the Ristside (wrist side) and Curvex-Ristside models. Designed to be worn on the side of the wrist, they place the dial in line with the base of the thumb. When driving, you can see the dial without turning your arm or letting go of the steering wheel. Sell for $2,150 or trade!